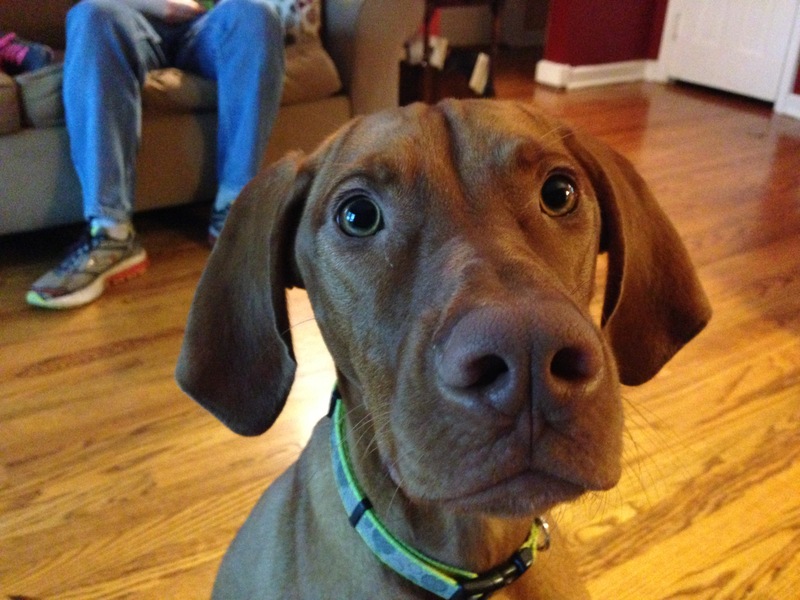 Gracie is a eight-month-old Vizsla who is a pretty sensitive puppy. Her guardians mentioned that she has some issues with excited and submissive urination, chewing, counter surfing, mouthing, jumping up and getting so excited she can’t control herself. Because she urinated a little bit when I arrived and another time when I wanted to pet her, I suggested that the members of the family refrain from petting or interacting with Gracie when she was in an excited state. Petting a dog like Gracie when she is too excited causes an overload that manifests itself as a urination accident. By simply ignoring the dog until its calm and sittings when the family members get home will help Gracie better control herself and her bowl movements. As we were discussing this I noticed that Gracie was always underfoot or in someone’s personal space. This need to always be next to a human can easily transition into a case of separation anxiety so I showed the members of the family how to claim their personal space when Gracie got too close. A great offshoot of claiming personal space is to give the dog a designated place to hang out. Gracie’s guardians had gotten her a dog bed, but because they allowed her on the furniture, she never used it. To dog’s the higher they sit amongst the members of their pack, the more rank the dog has. By sitting at the same level as the humans, Gracie thought that she was of equal status or authority. This can cause a dog to get confused as to what their role and relationship in the group is. After showing the members of the family how to claim the couch and disagree when Gracie tried to get up, I showed them how to condition her to use the dog bed. Another issue Gracie had was her intermittent recall on command. When she felt like it or the humans had a treat, she recalled when they called her. But if that wasn’t the case, Gracie didn’t respond to the recall command. I gathered the members of the family into a small circle in the living room and ran through a simple recall exercise that will help condition Gracie to come when called. Now that we had gone through a few simple exercises that used positive reinforcement to reward the dog for compliance, I knew I needed to teach the family a number of simple techniques and exercises to help the dog learn more self control. I ran through a few non verbal communication methods so that the family can start talking to the dog, in dog! By using body language, movement and position to communicate what they want, Gracie will be able to understand them better which will improve the leader follower dynamic. I also went over the escalating consequences I apply when a dog does not obey or listen; making a hissing sound to disagree, standing up abruptly and turning to face the dog, marching at the dog until it turns away or sits down or placing it on the leash. By consistently applying these consequences in a dispassionate way, Gracie will start to listen quicker and obey faster as he will learn that if she doesn’t, her guardians will apply these consequences until she does. To help the family practice applying these consequences, I ran Gracie through a leadership exercise I developed a few years ago. After only three repetitions, she seemed to get it so I walked the members of the family through it. The father of the family got a pretty good response from the dog due to his timing and technique. Now he had an inherent advantage as dogs see and respect size. Being the tallest member of the family, this gave the father an advantage the other members lacked. But it was really the father’s precise timing that spoke the loudest. When you are too early or late in your reaction to a dog’s movements, the dog either misses the message or doesn’t take it as seriously. This was apparent when the mother ran through the exercise a few moments later. At first the mother was only slightly tardy in her movements, but this was enough to cause Gracie to see an opening. She probed by moving forward and circling the treat on the floor to gauge how closely the mother was paying attention. At one point the mother didn’t track the dog with her hips and this was the opening that Gracie used to move in. But the mother stayed with it and recovered nicely. Once she started reacting with after timing and crisper movements, the dog started to oblige her and eventually surrendered. Since she got so excited when people arrived, I showed the family how to claim the area around the front door when someone knocked. Because of her sensitive nature, it only took me one correction to get her to move away from the door and stay back as I answered it. I had the guest repeat the door knocking a second time so that a member of the family could practice claiming the door area on their own. At first the mother moved pretty slowly which caused Gracie to pay her no mind. To dogs, crisp deliberate movements are seems as communication which should be taken seriously. Slow movements are often interpreted as just meandering around so dogs don’t pay attention or respond. Additionally the mother turned her shoulders away from the dog at multiple times. The direction your hips and shoulders are points is where your authority goes. So as soon as she shifted these away from Gracie, the dog started to move to the door again. I suggested that they practice the door answering exercise amongst themselves. By repeating this exercise a few times over the next week or so, Gracie will learn to stay behind the humans and let them handle answering the door. This distance from the door will help keep Gracie from getting so excited. In time, this will help the dog better control her bladder. By the end of the exercise Gracie seemed more centered. She was calmer, seemed to understand what her guardians were asking from her and already adhering to the new rules and structure. It will be important that the members of the family stop petting or engaging with Gracie when she is over excited so that she learns to stay calmer on her own. Once this is the case, the unwanted behaviors should stop as her obedience and self control improves.